Hi! My name is Pavarut Hinna, but everyone calls me Bew. I’m currently studying at the Silpakorn University, Faculty of Management Science, with a major is tourism management. I’m an intern and new member of the Andaman Discoveries (AD) team. I love nature and peace and quiet; I don’t like busy and noisy cities. My dream is to travel and find a different culture that I’ve never seen before. I just moved to Phang Nga Province and I’m very happy to be staying here in Kuraburi. Since my first day here in town I noticed that everyone seems to be very friendly. On my first day at the AD office I felt very shy but, after some time passed, I learned that I can gain valuable experiences and improve my skills with a little help from everyone on AD team. The AD team has always talked to me and taught me about how things work in the office and community-based tourism in general. 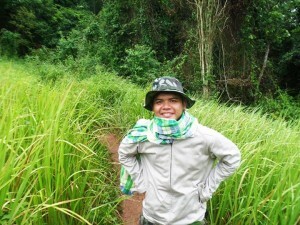 Recently, I had a chance to go to Surin Islands National Park with some guests and AD Director P’Tui. I had a great time while I was there; I was able to gain a lot of knowledge from P’Tui who taught me how to be a good guide. On the tour I met Moken people for a first time in my life. They live like a sea hunters and know almost everything about the sea and the jungle plants. The sea and jungle provides them with almost everything they need. They are great swimmers and can dive into the sea and hold their breath underwater much longer than average people. It was incredible! My dream of meeting a different culture came true my first week here. My internship at AD is for about three months. I’d like to say thank you to my advisor, Ajarn Jittasak Putjorn, for suggesting this internship. I’d also like to thank everybody on AD team that helped me qualify for the internship and will help me learn about the business over the coming months. Now, it’s time to improve myself and benefit from my experience.